Dr Jamie Wilson is a UK doctor and founder of HomeTouch. His company offers an online marketplace for finding experienced care professionals locally for elderly and personal care. The carers have an app that allows them to respond to job enquiries, monitors their care activities and manages their contracts. HomeTouch is supported by organisations like the Nominet Trust and Technology Strategy Board. What’s the journey behind how Home Touch was founded? When I was in med school, there were a couple of things I liked doing in addition to medicine. One was medical journalism and the other was working on entrepreneurial projects. In final year of med school, I developed a prototype for what was essentially a pupilloscope for detecting sleepiness in drivers. There had been a high profile accident that year, when someone had caused a major train accident because they had driven off the motorway after falling asleep. At the time I entered a competition with Medical Futures who were just launching and were aiming to help medical students and NHS doctors commercialise their ideas. A few months down the line, it was time for me to start my House Officer jobs so I put the prototype to one side, but I had really relished the experience of pulling disparate ideas and requirements together to make something tangible and useful. By the end of that year, I was in need of a break so I went to work in Melbourne, Australia in emergency medicine and psychiatry. I had a great year there and when I came back I started on a psychiatry rotation in London. I enjoyed the laid back culture of psychiatry and I met some very interesting people. It looks like you were set on a career path in psychiatry. What made you change your goals? Yes, that was until MMC (Modernising Medical Careers) was launched, which was around 2007. It was at that stage when I got to know people like Matt Jameson Evans who started Remedy. For me, MMC was a revelatory moment. When you work in medicine, I think you can be seduced into thinking that you are owed something by virtue of the work you do – respect, generous pensions, job security. The Damascene conversion I had was that this was an illusion and that if I wanted to succeed on my own terms, I would be better off stepping off the NHS career ladder. So I took the view that being an NHS consultant for the rest of my life was not that appealing anymore. So, that was the push. The pull was that I knew a group of entrepreneurial friends from school and I was starting to get to know other doctors who were doing interesting things so I did not see it as that much of a risk. …if I wanted to succeed on my own terms, I would be better off stepping off the NHS career ladder. So I took the view that being an NHS consultant for the rest of my life was not that appealing anymore. The next entrepreneurial project was to set up a website called Osler’s Node, which was a pun on the medical educationalist William Osler and a hub for medical paraphernalia and was basically a classified sites for med students, where people could flog old textbooks, stethoscopes and so forth. It was more of a side project rather than a proper business, but actually got a fair amount of traction. At that stage, I saw BMJ careers and I basically thought I could do a better job as it was more open and collaborative. Is the site still online? No, but I think in retrospect I should have persisted with it because it might have become valuable at some stage. It had the feel of Craig’s List in that it was a bit irreverent and niche. But what happened was that I got into London Business School (LBS) and by that point, I hadn’t raised any money for the website. I felt that in order to take it to the next step, I would have had to have done a fair bit of fundraising and I wasn’t committed so I took it down. How did business school help you? My time at LBS was really about trying to meet as many varied people as possible, exposing myself to different areas of the healthcare industry to see what I really like doing. I worked in pharma, went over to US, worked with a start up in Silicon Valley and I also studied at UC Berkeley. I networked a lot and started thinking about what I was going to do when I left. It was also an extremely demanding learning environment with lots of smart people which was very stimulating. When I returned to England I decided to focus on an area I was interested in, and that was early dementia. There seemed to be a gap in the market for people to care remotely for a relative or a patient with cognitive impairment in their own homes. We built the first version of a product and then raised some money through an early stage accelerator. Through the course of 2013 and the first half of 2014, we attempted to take it to market and the big lesson I took home from this was that it is incredibly difficult to sell a product to NHS organisations or large social care providers. What I began to realize, having spoken to people like Dr Thom van Every and Matt, was that in healthcare, although it is a huge industry, you have to be very careful with your business model selection. You might have a great product but if you can’t make sales, then essentially you are just threading water, you’re not making progress, you’re burning cash and investors won’t invest. That’s not a great place to be in. In healthcare, you have to be very careful with your business model selection. You might have a great product but if you can’t make sales, then essentially you are just threading water, you’re not making progress, you’re burning cash and investors won’t invest. There are actually a lot of medics out there doing that. Essentially, 90% of the healthcare market in the UK involves the NHS or its affiliates. It is very difficult to get in and if you can’t break through, then you’re in trouble because that’s the model your business is relying on; selling to the large organizations. There are success stories of course, but it can take years and years, so you have to decide if you are going to be that patient. Personally, I didn’t want to wait that long to see if something is going to work. I always think that if something is not working then you want to switch to something else rather than carry on. So in June 2014, we raised more money and we changed our focus. We built a marketplace for care. It essentially connects people who are trying to purchase care for family members with self employed carers. We handle the tools, contract management, payments and billing system. We launched it in December 2014 and it’s going very well, growing at about 20% a week. The potential market is large and its hard to see what ceiling there is on it if we execute on the marketing plan well. We are well positioned and we are the first player to seriously address this market with a digital platform with the model we are deploying. Finding good care can be stressful and is expensive. What we are doing is bypassing agencies and introducing efficiency and affordability by enabling people to select their own carer according to their own criteria. This is something you don’t get with an agency. At the same time the carers really like it because they can set their own rates, the area they want to cover and they have more flexibility and control than if they went through an agency. Although not a medical innovation, it is a business model innovation for the care sector. It has been a massive pivot and we have changed the focus of the company several times to get to where we are at the moment. As you can see from my journey, I don’t have a problem with accepting failure and moving on. In terms of your customers, do you deal with NHS or private healthcare commissioners a lot or do you mainly sell directly to the end-users? We sell B2C, so business to consumer. However, a lot of people who are purchasing care either for themselves or a family member, will receive funding from the Local Authority or Clinical Commissioning Group (CCG). So we are relying on NHS or Local Authority subsidization to a degree, which can create some problems with payment timing, but essentially, the customer pays with a credit card upfront, the money is held in an escrow account, and then it’s paid out to the carer in arrears and then we take out our commission. 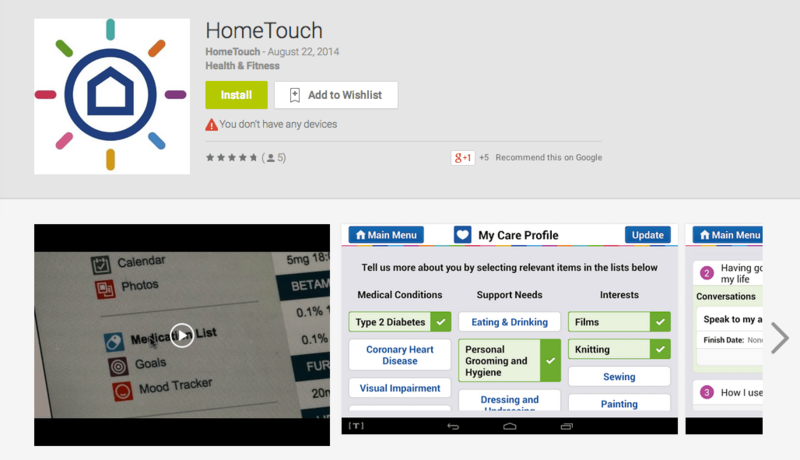 The Hometouch App is available on Android and iOS devices. Once you sign up you can set your care profile straight away. So how do most of your customers find you? Mainly through Google, word of mouth, partnerships and leaflets. We are on a massive marketing push at the moment. I think that is going to be one of the major challenges of this business, really scaling the business up. It is going to take a significant amount of money, but investment shouldn’t be a problem as long as we can prove that the economics of customer acquisition are right. What advice do you have about finding the right investor? Understanding your investor is critical. You need to find the right investor for your business model. For this kind of model, you wouldn’t get investment from someone more familiar with medical devices or pharma, but people who back marketplaces and understand aspects like network effects and lifetime value. A key consideration is that if you get to a certain size with a location based marketplace, you are very hard to displace. So this critical mass gives us an advantage, there is a winner takes all dynamic to it, that is very much related to the size and “liquidity” of the marketplace. Having success in this industry is obviously about service innovation and making the product as best as it can be, but it’s also about the density of areas you cover and how quickly we can scale up. Have you come across any competition in the UK or abroad? Yes, there are some competitors. The main competitors are the incumbents comprising all the care agencies of which there are several thousand in the UK so it is very fragmented. In the US, there is large site, but this doesn’t have the same model as ours. I think in the UK, we are probably the furthest ahead with a few smaller startups also beginning their journey. If you possibly can, find some niche whereby you can continue earning some regular income, whether that’s locuming or doing other work such as advisory work, that gives you flexibility. In terms of the future, where do you see yourself in 5 years time? When you are running a startup, it really is all about survival and it’s difficult to think more than a few weeks ahead. Where I would like to be is to have grown HomeTouch into something that has scaled internationally, that’s a really robust and valued product and where people just know that if they want to find a good carer then they come to HomeTouch. That’s the mission, and the team knows that’s what we want to do, and that it’s really about the quality of the carers we hire, the quality of the customer service, that the technology works and exceeding people’s expectations. At the moment, it really is quite a backwards and depressing sector and we are trying to bring innovation and transparency to it. At the moment, the typical customer journey is very stressful and typically people spend about £75,000 for a member of the household. We are trying to make that whole experience more streamlined and pain free. You worked for a number of other large companies, including the BMJ Group, Novartis and a startup in California. Do you think this experience was essential for the success Home Touch is currently enjoying? I think that it is just really tough to just go from medicine to business. There is much more complexity in running your own company than working as a doctor in the NHS. I think those other roles helped me see how different businesses work. For example, the BMJ was trying to make a transition to the digital world when I worked for them, as they were a traditional publishing house. Seeing that whole process was a useful experience. I could see how if you were a pure digital play, you could “disrupt” the incumbent’s business model, leaving them no alternative but to respond, so I learnt a lot form that perspective. With Novartis, that was also very much understanding how digital was impacting their business in an era of declining profitability and it was also about seeing what a big company is like, because I never worked in a large company before. I enjoyed it, but I also realized that I didn’t want to work in a corporate environment. When I was in California, working in a startup environment, that’s when I realized what I really wanted to do. I picked up a lot of contacts and a developed lots of new skills when I was out there. I think I always knew that I wanted to do my own thing at some point, but it wasn’t so much that it gave me the idea for the product, it was more about deciding the kind of environment I wanted to work in. One of the advantages of going to LBS is that you will have opportunities to go and try these things out pretty easily because the school’s reputation gives you that access. 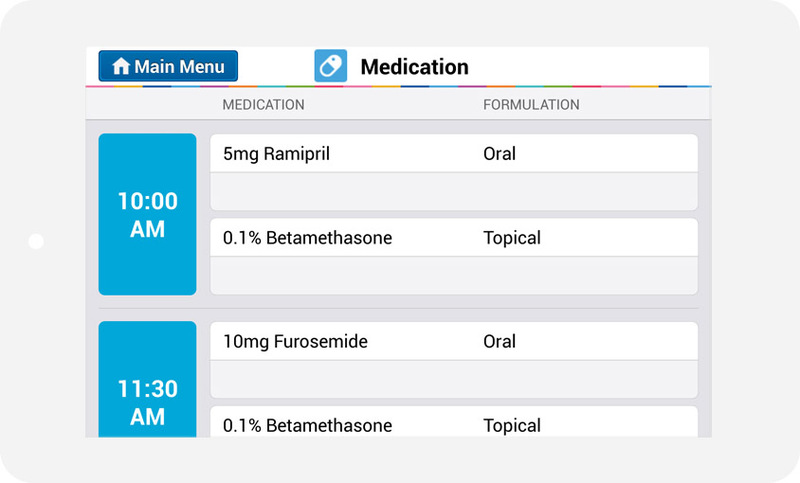 Among other features, the Home Touch app features medication reminders. Was HomeTouch a full time job for you from the beginning or was it more of a side startup? I was always committed to it full time. However I also kept my medical license. I think you’ll find different opinions here, some people say that you have to give it all up, but my experience has been that I’ve actually been able to earn well from only doing a few hours of medical work per week. This meant that I didn’t have to worry about paying myself a salary out of HomeTouch. It has been more and more difficult to do it as things went on, but if you join the Independent Doctors Federation, they will help you along with revalidation and appraisals. In my case I started off by locuming, but even that was too time consuming, so now I mainly do reports and Mental Health Act assessments. So is your advice to doctors to carry on with their clinical job in the early days of a startup? In a way, it comes back to the issue of survival. Although you may be committed to your startup, how are you going to survive? The reason most people have to shut down their business is because they needed a paycheck. A young business just consumes cash and it will be a while before the money is going to come in. If you give up your other job and then start a new company, and you have problems raising money, and you’re not bringing in sales, then you quickly arrive in a financially difficult position. My advice would be, if you possibly can, find some niche whereby you can continue earning some regular income, whether that’s locuming or doing other work such as advisory work, that gives you flexibility. Remember that most non-medics do not have this option, so you are giving yourself an advantage by not having an expiry date on your involvement. What other advice would you give to a medical student or doctor thinking of starting their own company? I think the best thing to do is to go out and meet people you respect and aspire to be like. I am always receptive to going out for a coffee with keen entrepreneurs who want to learn more about business and innovation in medicine and I know that is the case with most entrepreneurs. I think one great thing of being a med student is that you have that flexibility, you have time to think and can really contemplate what you want to do. I definitely remember that final year of med school being one of the best periods of my life because everything was in front of you and everything seemed possible. It’s a time of great hope, expectation and freedom and you just want to get out there and experience as much as possible.